Thai artisans make each of these arboreal coat racks by hand from reclaimed mangosteen trees. Yosemite is a natural wonderland. Its grandeur and beauty have inspired onlookers for centuries, and it even inspired the creation of the national park system. 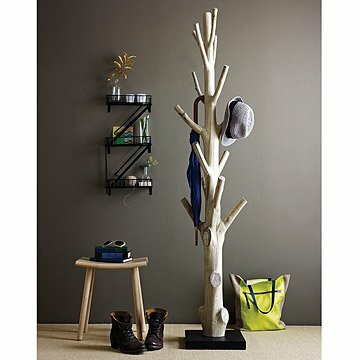 It also inspired this all-natural coat tree, which began its life in a very different kind of forest on the other side of the world. It's made from mangosteen, a tree famed for its nutritious fruit. But mangosteen trees only produce fruit for a number of years, and then are burned down to make room for new trees. To prevent those resources from being wasted, Thai artisans have reclaimed the felled trunks, and trimmed, sanded and stained them to form these handsome coat stands. Because they're made from actual tree trunks, each one is unique. Each will have between 10 and 15 "hooks", and their heights will vary. Place it near the entrance of your home or office, and enjoy your own private piece of the great outdoors. Made in Thailand. Click here to check out our Yosemite Coat Hook. 15.75" L x 15.75" W x 75" H; 59 lbs. Dust clean with a dry cloth. This coat rack is one of the very few larger pieces in my bed room, and will hold a few purses, scarves or necklaces. The rack itself is absolutely beautiful in it's natural simplicity, and I don't want to cover it up completely. It would be beautiful without anything on it or with just a small light chain. In the picture there are 14 "hooks". Mine arrived today with only 10 hooks and a card that says you might get 10-15 hooks. While I think it is really cool looking and useful I'm very disappointed about this. I'm realizing now that this was in the description on the website so my fault for not catching it. However, we are a family of 6 and I was counting on everyone having 2 hooks each plus some for guests. You want a clothes tree? THIS is a clothes tree! Fits nicely into the entry of our new home in Colorado! It's a coat rack, so its beauty gets hidden when put into use. Coats will be removed when entertaining company. Gorgeous and unique. Searched high and low for a coat rack that would compliment my decor. There seemed to be no alternative to the standard metal version from the 1950s. This is so beautiful you almost hate to cover it up with coats. I use this to hang my indoor plants on...prickly pear..succulents..dragonfruit. love it! Stunning! Just needs a stronger base or packaging. What a unique, beautiful, and functional piece! I am surprised they haven't improved the packaging yet. My box was beat up and ripped open on two sides. The tree is sturdy and was fine, but the base is smashed up on the corners. What a pity. Really attractive, well built. I had no issues with the packaging or the base. A beautiful and functional piece. It is sturdy, has plenty of "hooks" and looks great. I was concerned about some "cracks' in the trunk but I think they are a natural part of the tree. We use it to organize hats. Wish all the upper branches had been left to maximize storage. Not clear why they were cut off. Base should be improved because flimsy. Had to turn it not to show the part where it separated.